Even if many Modern Soul aficionados know the track "I’m back for more" well, very few people though can say who actually composed it: Kenneth "Kenny" Stover, of course !!! Kenny’s career began thank to Harvey Fuqua, leadsinger of moonglows and well-known producer at Tamla Motown, who enabled his cousin "Kenny" to write his first songs for the prince of soul marvin gaye. That is therefore in 1972 that Kenny wrote his first track you're the man (part i & ii) that Marvin recorded during the session of what's going on . Before finalizing his album, theTamla Motown decided to test the potential hit of you're the man (part i & ii) (to listen to absolutely) on 45s. Unfortunately, that track did not meet the expected success, and the Motown will not choose it for the album. In the meantime, Kenny Stover made his first steps as a backsinger for Marvin on the cult track "Inner City Blues" from the same album. In 1977 he created with 2 other accomplices, "Johnny Simon" and "Allen Few, the band leo's sunshipp they named as such because they were all 3 born under the sign of the Leo. During the recording of their only album we need each other, Kenny composed the famous "give me the sunshine" and the great mellow hit "I’m back for more" that will be found the same year on the album of tavares : madam butterfly. Unfortunately the band only made one album as "Johnny Simon" passed away before the album came out. But the year after, Kenny formed another band finished touch and they signed on the Motown a small success with the track need to know you better. 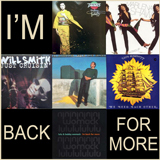 As a conclusion, we selected 6 covers of "I’m back for more", and would like to know which version is the best one for you? So, dim the lights, and let yourself go with "I’m back for more" !